Santa Hat White Chocolate Pretzels are a fun and easy Christmas recipe to make. You need a few simple ingredients and you will be soon making plenty of these Santa Hats on your own. One of my favorite things about the holidays is cooking and baking. I personally just love to create gifts for those who are special to me. Growing up my Mom would always make all sorts of cookies and candies right around the holidays. For me it isn’t Christmas until there are peanut butter balls, hello Dolly cookies, Chex Mix, and fudge. I recently saw this fun photo on Pinterest and I knew I had to try making some of these white chocolate Santa Hat pretzels. I found these easy to make, and instead of dipping the pretzels into the chocolate as suggested, in my version you lay the pretzels down on waxed paper and then you spoon the chocolate over the pretzel. I think this makes it a little easier. 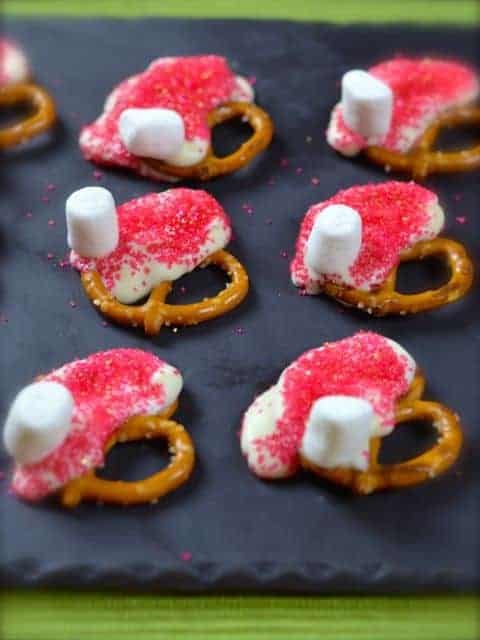 Make adorable Santa Hats with pretzels, white frosting, and red colored sugar. Melt white chocolate using a double boiler. Make a double boiler by using a medium sized pot filling it with water, and placing it on the stove. Turn the stove on so the water boils, and then place a heat proof bowl on top of the pot with boiling water. Turn the heat down until the water just simmers. Add the chocolate and it will melt. Once it melts remove the pot from the stove. Lay out several pretzels on a sheet of waxed paper. Spoon melted white chocolate over 2/3 of the pretzel, you want to leave one of the small portions of the pretzel uncovered. Sprinkle red sanding sugar over the white chocolate. Place a marshmallow on the corner of the chocolate covered hat. You can cut the marshmallows carefully in half and for a smaller white portion on the hat. To yummy recipe! My canary loved to watch me make these. What a fun recipe for Christmas. Thank you for sharing the recipe.